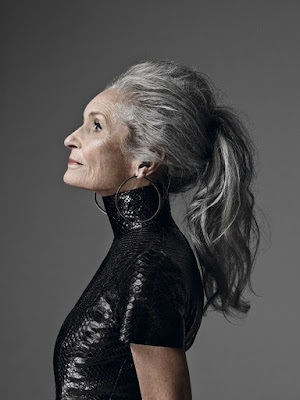 Honestly, who amongst us in the grey haired brigade, wouldn't want to look like Daphne Selfe in our 80s? I love this take on the bouffant high ponytail, and it's a favourite here. A bit of texturizing mousse or dry shampoo to the roots, a light tease with a fine toothed comb, hair scraped up roughly, secured with a non snag ponytail elastic, and you're done. Actually I think Daphnes is a sort of high ponytail with French pleat under... very nice. Needless to say, track suits, capri pants and birkenstocks are a no-no with this hair style. The rest of you needs to be sleek and tidy. I don't know why. Because. It's nicer when you're our age. Just because you've decided to go grey, doesn't mean you sell yourself short. You actually have to make more of an effort in many respects....or at least as much effort. For more on that, read my post on going gracefully grey here. My hair used to tumble over my shoulders in delicious ringlets with no effort whatsoever. Not so now, thanks to the march of the years and merciless menopause. Now I just get untidy, unwieldy frizz...sigh. But I can get curls just like this lady in the picture above, using the wrap headband method. Google 'headband curls' and be enlightened! I use a 5cm (2 inch) wide crocheted headband to wrap my curls. It works surprisingly well, and makes me look less like a granny should I be called to the door mid-curl. The great thing about this method is that you really can sleep in it (Google, and you'll see), and be fab in the morning. Alternatively, I've wrapped my curls first up in the morning, and had them bouncy by lunchtime. In a pinch, you can convince friends you're channelling Downton Abbey when you're 'wrapped' and surprised by visitors. It's a very Lady Mary sort of look really. I have to emphasise though, that the key is no product before wrapping, almost dry hair (just barely damp), and unwrap the same way you wrapped, gently separating the curls...no brushing! 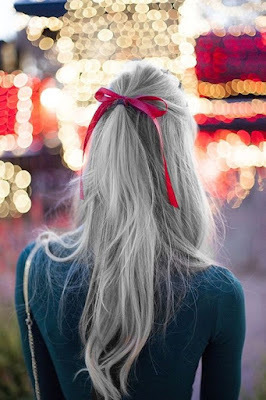 Do NOT be tempted to drag the headband from your locks in haste....that will end in tears....and a haircut. On days when I'm still smooth and sleek on Day Two after washing, drying and straightening, I like this last one. It keeps my hair off my face, embellishes it neatly, and makes me feel a little more polished. This is a regular go-to for me. As with the ponytail, clothing and jewellery must be neat, sleek and tidy. NO other frou-frou required. It's a minefield this grey hair thing, I tell you. Thanks go to Vicki Archer of French Essence for inspiring todays post with her own post on the silver up-do, found here. Mimi, you just made my day! I stopped coloring my hair about 3 years ago and have been freed! And I love the way the silver highlights my face. Yes, we can be fabulous at 50 (or older) and you just showed us why. Like Mary K., I too, dear Mimi, am perfectly comfortable in my graying, chicken-yellowing red hair. My husband tells congregations I'm "the most beautiful redhead in the world," and people approach him later. "Redhead?" Yeah, I'm know as strawberry blonde... Wow. I love it!!! I found your blog via Vicki Archer. I let my hair go grey several years ago and have never looked back. I agree with your comment on Vicki's blog. It is not for everyone and I try not "preach" the virtues of going grey. So glad to have found your blog. I am a new subsriber! I'm a silver haired lady, and love it!! I get many more compliments on my hair now that I've embraced the gray. Just yesterday, my physician was telling me how he liked it and thinks it suits me. Love this post!! I love all of these hairstyle and the models with the pretty grey hair. That is a popular trend right now. I do hope you will join us again and share this post. Thanks also for hosting your wonderful party each week. Thanks. Your hair is absolutely beautiful. I'm so glad that us "older" woman can be ourselves. I've earned everyone of those gray hairs and I wear them proudly !!! My, what lovely silvery hair! I think it's so important to simply be ourselves, dear friend, and this post certainly embraces that. Thanks for sharing with Roses of Inspiration. Love and hugs to you!